Space is a one of the most overlooked aspects of painting and one that is significant even if you have no intention of producing a real life three-dimensional scene. It is possible to talk of space even on a two-dimensional surface in terms of the space covered by the paint. In this sense a space can appear ‘sparse’ or ‘full’. However, it is possible to conceive of an entirely painted surface as sparse, and this will depend on the colours, tones and lines that you use. Similarly, what is actually a relatively simple surface can seem full, such as in the case of Malevich’s black squares on a white surface (early 20th Century): black tends to dominate and stifle lighter colours. In the sense of contemporary paintings, where little attention is paid to ‘perspective’ space will tend to be conveyed by the manipulation of colour and tone. Creating space with colour and tone in is really about letting the picture surface ‘breathe’. In this sense, and in keeping with our vision of reality, blue and green and white areas of a painting convey more space than red, orange and black areas. Yellow and purple colours will affect the space according to their surroundings, in some instances expanding space, and in others restricting it. Where a real life three dimensional space is hinted at through the artwork perspective will usually be employed. ‘Perspective’ is a system employed with a view to accurately rendering the shift in scale that occurs towards the horizon of vision in real life. Using perspective, things can be correctly ordered across the plane of the picture surface to reflect their relative shifting in scale as they recede from the viewer in each direction. Prior to the development of perspective in the Renaissance period space on the canvas was ordered in relation the religious importance of the subjects portrayed, with little regard for conveying space and distance accurately. During the Renaissance art met with science in an attempt to accurately map out space as if the painting were a window on to the real world, with everything in the painting pertaining to the real relationship of objects as they appear to the viewer. Piero Della Francesca (1412-1492) is one good example of a Renaissance painter who employed perspective in this way. Perspective can be charted on to a picture mathematically before beginning a painting by subdividing the canvas in to areas all meeting at a ‘vanishing point’ somewhere on the canvas. Thus vanishing point represents the point in real perspective where objects are so distant that they seem to disappear. Curiously, real life perspective is rarely used by painters today, and is barely even taught in colleges as a real life images is often perceived to be one closer to a photograph. 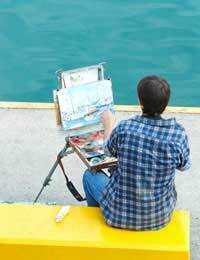 Oddly, a painting taken directly from a photograph will often seem to lack perspective, even thought the photo may have seemed to convey perspective and foreshortening. This is because a photograph is flat and the painter will render a copy of the photo purely by copying colours and tones to produce a flat painting, that whilst being absolutely accurate to the photographed image, will not appear as a ‘real’ image. This says a lot about our changing perceptions of space, especially as many of us see images in the closed confines of two-dimensional space every day (the TV. screen, the computer screen, the magazine phone screen or billboard. It may well be that the most accurate artists of the future are those who can respond to this situation. How one creates space generally will depend on what it is they are trying to convey. An awareness of differing techniques and their historical context will enable the painter to confidently make decisions regarding pictorial space.